Not much will come in between me and food, but this painting did. As my family and I were eating dinner, I was watching the sky getting darker and darker until it opened up and poured for about 15 minutes then the sky turned a crazy orange color. I got up from the table looking out the windows trying to get a good view- maybe something I could paint. I ended up walking down the street to get a view of the sky as it moved from a pinky-yellow color to an orange. I did a quick painting, working with large brushes and a pallet knife on a small 8 x 6 inch surface. Jim and I were recipients of one of the last artist residencies at the Elizabeth Bishop House in Great Village, Nova Scotia. We spent a week in the childhood and spiritual home of Elizabeth Bishop (1911-1979), former poet laureate of the United States (1949-1950), and winner of the Pulitzer Prize (1956) and National Book Award (1970). We enjoyed painting, drawing, reading, and taking photos at the house and nearby. It was an inspirational space. The house was full of the work of previous writers and artists who stayed there and books by and about Elizabeth Bishop. 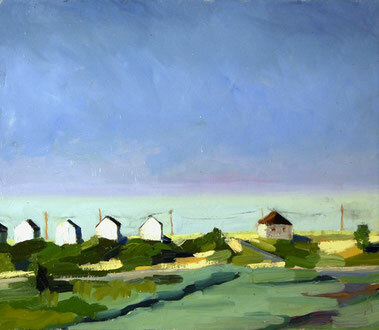 The light off the Bay of Fundy and rolling hills of this rural place fueled many paintings. We extended our art-making trip into Maine and spent another week on Penobscot Bay making more work. We are back now, finishing work started on the trip, reading back through journal entries and decompressing from a great art making trip. Unfortunately, after ten years of providing residencies to artists and writers the program has ended. We feel very lucky that we could work in the wonderful space and around Great Village environs. 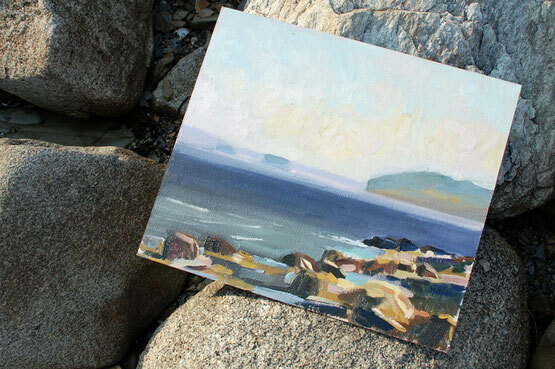 Pattie McCarthy used my painting North 6 Haze in her Jacket2 review. Pattie McCarthy comments on subtexts within Ryan Eckes’ first book, Old News (Furniture Press, 2011) for Jacket2 . 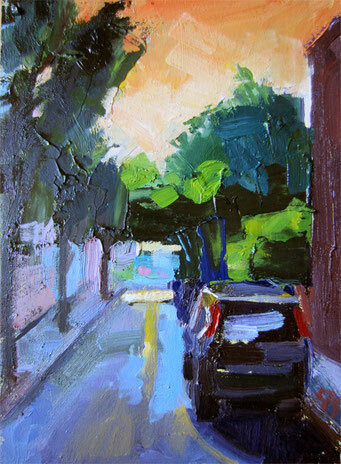 Kate Kern Mundie captures Philadelphia’s offbeat splendor in traditional landscape paintings. 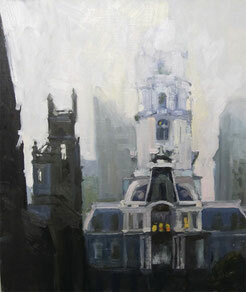 In one piece, she depicts a foggy, gray sky over Philadelphia’s City Hall with pleasing, chunky brushstrokes. Another painting reveals the stark difference between the tranquil Schuylkill River and the harsh highway circling around it. Mundie, a Pennsylvania Academy of Fine Arts graduate, takes a cue from the Ashcan School painters. The early-20th-century artists highlighted the aesthetics of working-class neighborhoods and urban streets. Many of them also attended Mundie’s alma mater, but that isn’t why she looks to them for inspiration. “I was drawn to it because of their bold contrast between light and dark colors,” she says. Through Dec. 29, opening Fri., Dec. 7, 5 p.m., 221 Arch St., 215-922-5155, thefangallery.com.